In the academic study, the dating process of the business cycle has been changed from a graphical orientation towards quantitative measures extracted from parametric models. For instance, Burns and Mitchell (1946) explained the main concepts of the business cycle and introduced a graphical (classical) model that aims to calculate the peak and trough of the cycle. While Cooley and Prescott (1995) started to calculate the cycle by using the variable moments of the parametric (detrend) models. Burns and Mitchell define that business cycle is a pattern seen in any series, Yt , taken to represent aggregate economic activity. In the process of defining a cycle, we usually use the logarithm of series Yt . 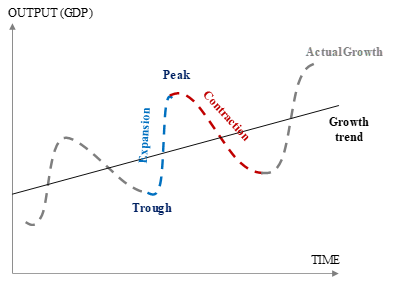 Business cycles are identified as having four distinct phases: trough, expansion, peak, and contraction (Figure 1). These are the characteristics of a cycle. Peak (A) is the turning point when the expansion transitions into the contraction phase. Trough (C) is the turning point when the contraction transitions into the expansion phase. Duration (AB length) is the number of quarters between peak and trough. 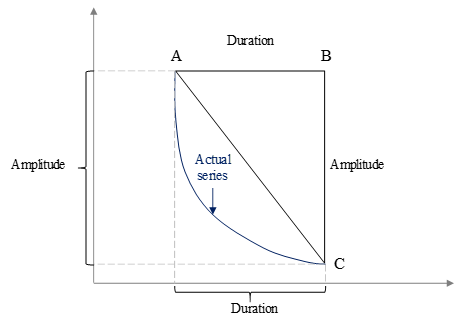 Amplitude (BC length) is the height of differences between peak and trough. 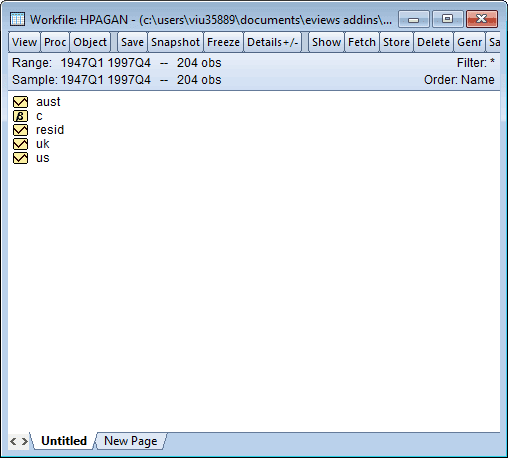 The EViews add-in “BBQ” implements the methodology outlined in Harding and Pagan (2002). Harding and Pagan (2002) chose three countries, the US, the UK and Australia and established turning points for each country by using Bry-Broschan algorithm. This algorithm performs the following three steps. Estimation of the possible turning points, i.e. the troughs and peaks in a series. A technique for alternating the troughs and the peaks. A set of rules that meet pre-determined criteria of the duration and amplitudes of phases and complete cycles after step 1 and 2. We will replicate the result of Table 1 of Harding and Pagan (2002). The example program file (bbq_ex1.prg) will generate the result. First we need to open the data file named as hpagan.wf1. Data of hpagan.wf1 is quaterly real GDP of the three countries. 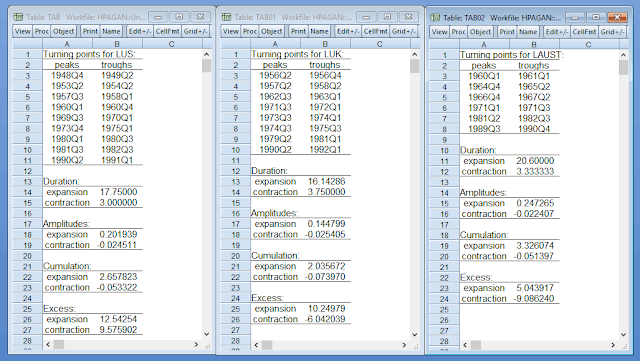 The sample size for the US is 1947q1 to 1997q1, for the UK 1955q1 to 1997q1 and for Australia 1959q1 to 1997q1. Next we take the logarithm of series us, uk and aust. Then we apply the bbq add-in to each series. We can do this either by command line or menu driven interface. By definition, a peak happens at time t if Yt-k,…,Yt-k+1 < Yt > Yt+1,…,Yt+k . k needs to be set for example k=2 for quarterly data, k=5 for monthly data and k=1 for yearly data. k is called the symmetric window parameter (turn phase). Other restrictions are often imposed on the phases. Minimum 2 quarters for expansions and contractions are often applied, in line with the rules used by NBER when dating these phases. This is the minimum phase. 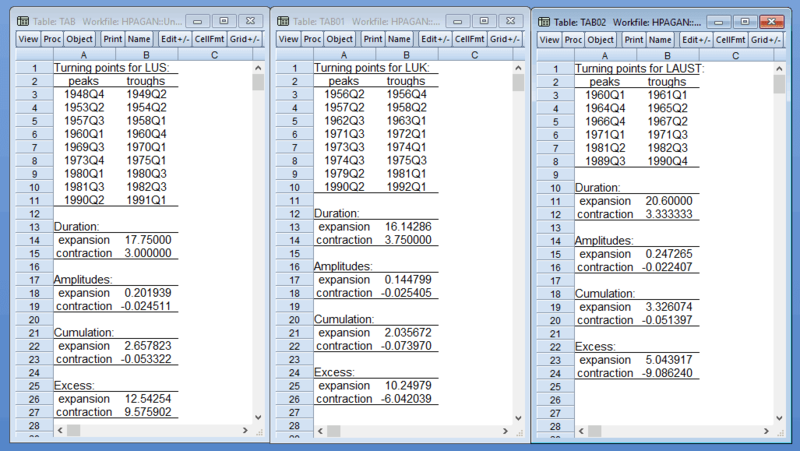 A complete cycle length (contraction plus expansion duration) of five quarters is also common for quarterly data. This is the minimum cycle. Finally, it may sometimes be desirable to overrule the minimum phase restriction. For example, if the fall in a series is very large one might allow the contraction to be quite short. The parameter controlling this is threshold (thresh). Alternatively you can implement the BBQ add-in by menu driven interface. In order to do so first open the series, i.e lus. Then go to proc/add-ins menu and choose Bry-Broschan-Pagan-Harding BC dating menu. Bry and Boschan (1971). "Cyclical Analysis of Time Series: Selected Procedures and Computer Programs", NBER, New York. Cooley and Prescott (1995) ʺEconomic Growth and Business Cyclesʺ Frontiers of Business Cycle Research, ed. Thomas F. Cooley, Princeton University Press, 1‐38. Pagan and Harding (2002) "Dissecting the cycle: a methodological investigation", Journal of Monetary Economics, Volume 49, Issue 2, 365-381. Analisy in EViews 9 or 10? Thanks! EViews 10. But the add-in should work for EViews 9. 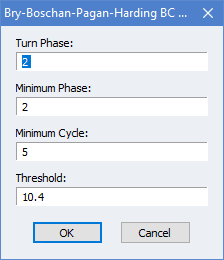 In the add-in, what is the threshold for? The per cent decline? i.e. is 10.4 set so that a decline of 10.4 per cent considered a contraction?